Can be rare configuration (as everyone is using SGP, Voyager NINA). I'm using SGP too but having strange problems with it lately so thought I try AstroArt because I used it a lot before. But last night was my first when I tried to center & sync with it and it didn't work. Find coordinates worked fine - so plate solving works. But Centering using plate solving seems to do nothing. So do any of you have better experience with such combo ? Can you successfully slew to an object from AstroArt? Which means the mount's ASCOM interface is running and AstroArt is connected to it and can control the mount? You may want to check your mount drivers and the epoch translation with the software you are using. This might not be the issue, but there was a previous thread with a similar problem regarding JNOW/J2000 using SGP and the driver update resolved it. I use SGP with CEM60 and have not experienced any problems but I remembered the thread. There is a link in that thread to the SGP discussion which has more info. Good luck. CEM60 ASCOM drivers do not fully implement all features. 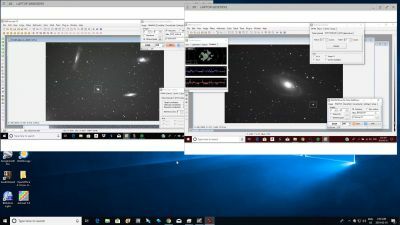 I use Astroart7 with a CEM60/CEM120 and platesolve centering works well. It sounds like you are using it incorrectly. in AA7 you use Telescope control window-> GOTO tab and goto your target location, take an image, use the Telescope control window->CENTER tab->Goto platesolve tab-> check the jnow box and click the CENTER button. AA7 will plate solve the current image, determine the offset from the target location and slew the mount to the target location. Edited by DuncanM, 21 March 2019 - 12:36 PM. Good to know that you have CEM60 and it works. Have CEM60-(EC) too and did just like you said (originally from Astroart formu site, I guess..). Didn't use Jnow, but wondering if that makes difference. Also, Goto(manual) Centering seems to work (almost) so connection to mount should be fine. Another try tonight as it's full moon and bright night. If the platesolve after the Goto platesolve button is clicked fails then nothing will happen, but it will report that it couldn't platesolve. It's important to finetune the platesolving engine for optimal performance and you do this via the "find coordinates" icon on the left side of the AA7 window. I had some success tonight, but it I find SGP's plate solving more robust. Too bad SGP did crash again using Starlight Xpress CCD ASCOM driver. So original goto/image can't be too far away. But good to know that in principal it works. What problems were you having in Astroart? Didn't realize first I had to increase first plate solve tolerance considerably because first slew was more than degree off (and I had 31x25' field). Search Region = target catalogue number; you can enter (for example) m101, or n2419 for Messier or NGC catalogue objects, or you can click on the small button to the right of the catalogue field which will use the current image's coordinates as stated by the mount via the ASCOM driver. Size RA/Dec should be left at the default 4 and 3 degrees, until you are confident that maximum slew error is less than this amount. In the 'Image' field you should have your camera's horizontal (widest side) dimension in arc minutes entered into the field and once you are certain that it is correct then reduce the % to 1 or 2. This will prevent false solves. Given your field I would leave reference stars at 5. When you have it all set then press the 'save parameters' button. Some images are vertical flipped at the camera and then you'll have to check the vertical flip box. You can also use the Star Atlas to find objects and issue GOTO requests. Once you have the current image plate solved the camera frame will show on the Star Atlas along with a cross indicating reported telescope coordinates. If you zoom out on the Atlas you can watch the cross move as the mount slews. You can also issue GOTO commands via Skycommander for objects not in the AA7 Star Atlas, such as the Abell catalogue. Edited by DuncanM, 22 March 2019 - 03:23 AM. Back to this topic now that I have used AA's plate solving more. It doesn't always center object using plate solve (even if it has found coordinates). And in my last session I first used Find coordinates, then plate solve center, not center, then again Find coordinates and now it refused to find coordinates. Luckily manual centering is working better. Edited by einarin, 08 April 2019 - 12:07 PM.